Skip the greasy food or the sweet cereals for breakfast. 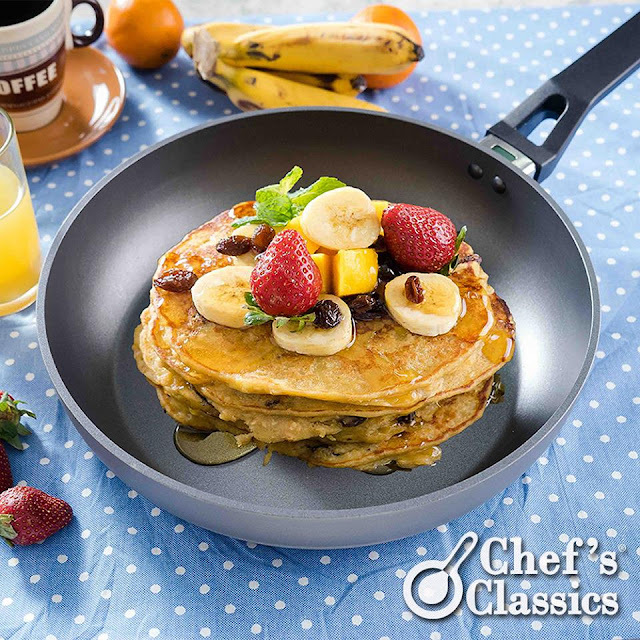 Whip up a batch of Banana and Oats Pancakes for a heavenly first meal of the day. Who's up for a fresh and healthy breakfast? 1. Mix beaten egg, milk, olive oil, banana and sugar. 2. Add flour, baking powder, raisin, salt and oats in the banana mixture. Mix thoroughly. 3. Heat Chef's Classics Safflower Frypan. then add ½ cup banana pancake batter. Turn when bubbles form on top. 4. Cook until second side is golden brown. 5. Serve with fruits. Good morning!